TechnicBRICKs: Week TechVideo, 2008 #02 - KKK also has fun with TECHNIC! For those who don't know, KKK is Kjeld Kirk Kristiansen*, third generation of the 'LEGO Family' and grandson of OKC who founded The LEGO Company. It is a MOC from Fabio Sali or Fabione (ITLUG) and more photos can be found here, or an additional video here. 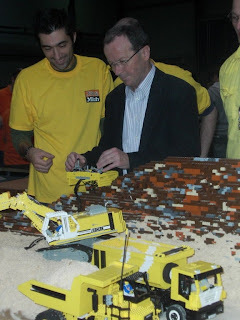 His excavator was later modified to be at LEGOworld 2007, already with new PF elements replacing the classic 9V motors and the new treads from Snowmobile (8272) and Bulldozer (8275). Here you can see a few intermediate photos and a video after the modifications done. ... and, can you see who was also there to have fun? Yes, Markus Kossman himself! The creator of the 8412 (Mobile Crane) and 8275 (Buldozzer), just to give a few examples. - May it suggests what's next!? 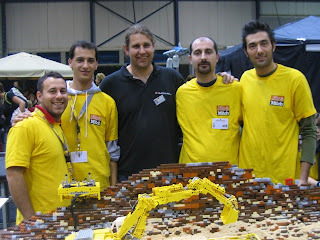 - And that we could get a TECHNIC Tower Crane for 2009 (even if a smaller one)??? - Would you like to have one? * Principal shareholder of The LEGO Group, former CEO and actual Chairman of LEGO Holding A/S. The LEGO Group is a privately held, family-owned company, based in Billund, Denmark. Sorry, that is a sad coincidence and it was not my intention at all! The full name was too long, but of course I could have used just Kjeld. All 3 generations of LEGO owners are commonly referred by their 3 initials (OKC, GKC and KKK). Google for "LEGO KKK" or any from the others, and you'll by yourself. OKC is also referred in the post as this. I wonder also why Kjeld, didn't got KKC as their predecessors ??? How did the Christiansen surname, became to Kristiansen?